The Road Galleon is Bowser's kart in Mario Kart Arcade GP DX. It grants the user a handling boost with no other benefits. It is shaped like an Airship similar to the Landship from Mario Kart 8. 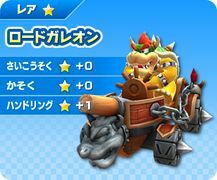 Unlike the Landship, Bowser's head can be seen at the front of the vehicle. The steering wheel is also like a ship's wheel. It also features chains around the sides of the kart. The back of the kart has 2 Dry Bowser heads mounted on it. The Road Galleon's alternate colors are green with red lines and black with gold lines. This page was last edited on October 28, 2018, at 08:38.